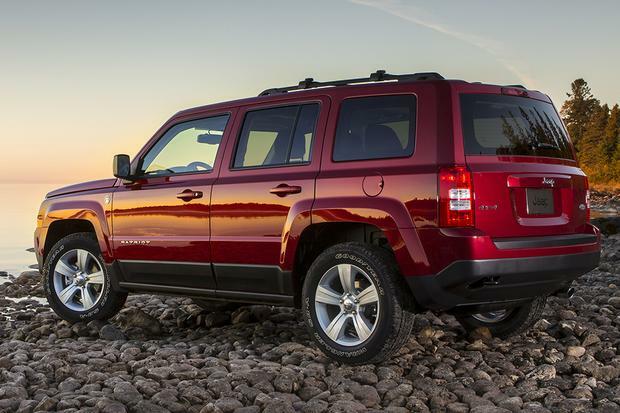 The 2017 Jeep Patriot compact crossover hangs on for one last model year before becoming history. Video | Killing the Original Jeep Grand Wagoneer was a Big Mistake -- Or Was It? Canceling production of the original luxury SUV in 1991 might have been a good move for Chrysler in the long run. 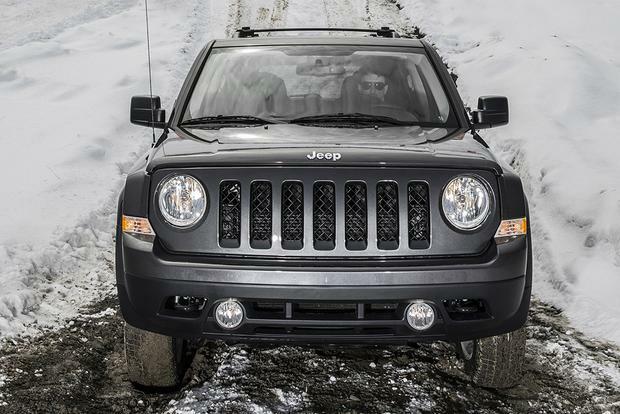 Updated with standard front-seat side airbags and a new 6-speed automatic transmission, the 2014 Jeep Patriot blends efficiency and flair. 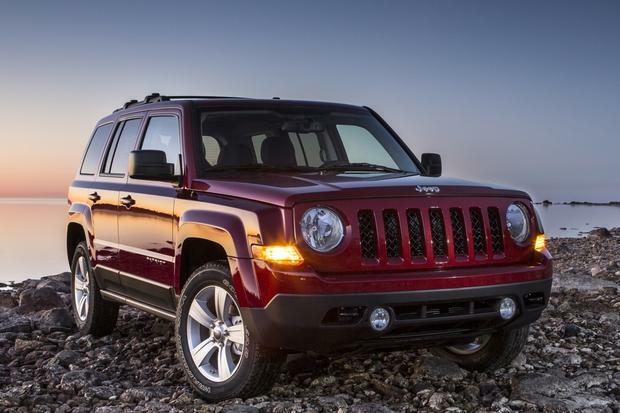 The 2015 Jeep Patriot blends traditional Jeep styling with a compact-car chassis. It's not the most modern or sophisticated SUV, and there's a lot of hard, plastic trim inside, but the Patriot offers good bang for the buck. 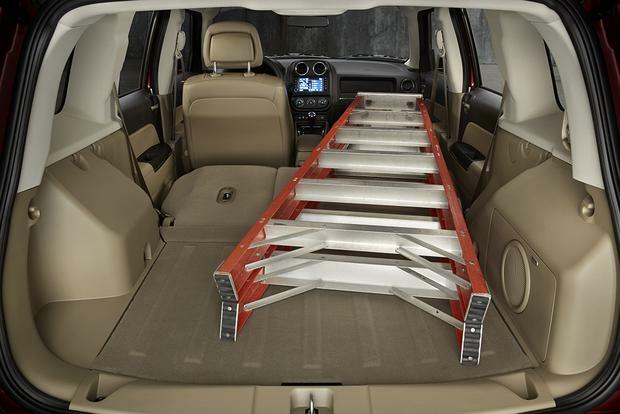 The Patriot's ride, handling, step-in height and fuel economy are more akin to a car's than an SUV's. The 5-door hatchback will carry five passengers (only four comfortably) and contains 23 cu ft. of cargo space that increases to 53.5 cu ft. with the rear seat folded flat. 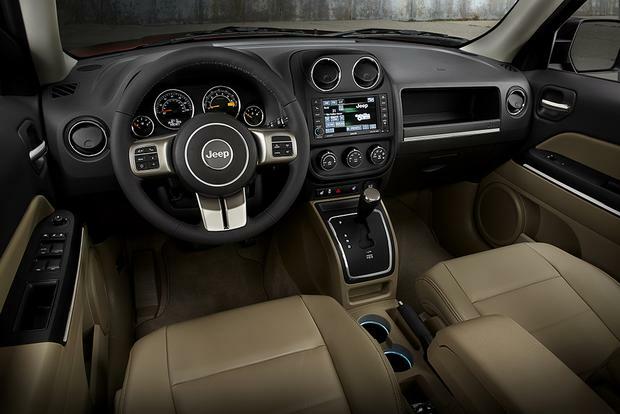 Along with the Compass, the Patriot was the first Jeep available with front-wheel drive (FWD). 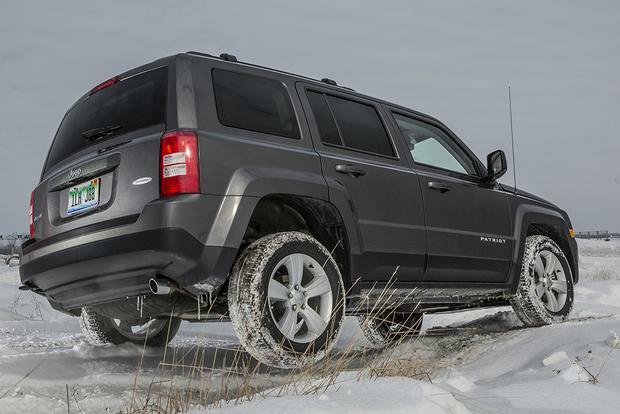 It being a Jeep, two all-wheel-drive (AWD) systems are also offered. Freedom Drive I is a full-time active system that can be driven year-round. A lock mode for the center coupling provides extra traction in deep snow and sand. Freedom Drive II is a trail-rated off-road package with an extra inch of ground clearance for traversing steep terrain and fording water up to 19 inches deep. Skid plates, 17-in all-terrain tires, tow hooks, hill-descent control, a 19:1 crawl ratio, brake-traction control and a continuously-variable transmission (CVT) are included. All Patriot models except the Freedom Drive II off-road package are now available with a Hyundai-built conventional 6-speed automatic transmission that eliminates the engine droning associated with the previous CVT system. New for 2015 is a High Altitude trim package on AWD models with leather seats, 17-in gray alloy wheels, a power driver's seat and a power sunroof. The 2015 Patriot is available with a choice of two engines. Standard on FWD Limited models and all AWD versions is a 2.4-liter dual-overhead-camshaft 4-cylinder that produces 172 horsepower and 165 lb-ft of torque. The Environmental Protection Agency (EPA) rated the FWD Patriot at 23 miles per gallon in the city and 28 mpg on the highway with the 5-speed manual transmission and 21 mpg city/27 mpg hwy with the 6-speed automatic. AWD models get 22 mpg city/27 mpg hwy with the 5-speed manual, 21 mpg city/27 mpg hwy with the 6-speed automatic or 20 mpg city/23 mpg hwy with the combination of the CVT and the Freedom Drive II package. All models use regular, unleaded fuel. Standard only on the Patriot Sport and Latitude with FWD is a 2.0-liter 4-cylinder rated at 158 hp and 141 lb-ft of torque. This drivetrain combo is intended for buyers who won't venture off road and are willing to trade acceleration for improved fuel economy. EPA estimates are 21 mpg city/28 mpg hwy with the 6-speed automatic transmission and 23 mpg city/30 mpg hwy with the 5-speed manual. It also runs on unleaded, regular fuel. 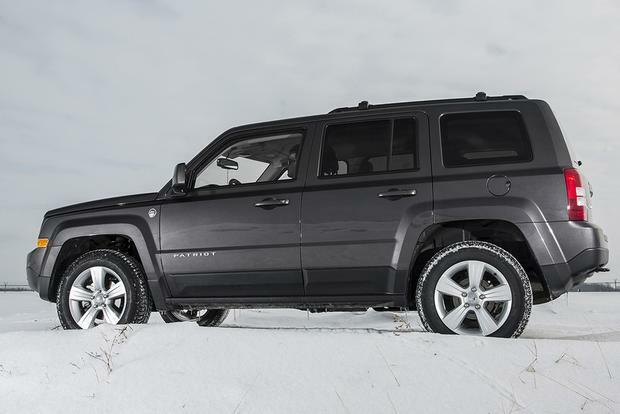 The 2015 Jeep Patriot is available in the Sport, Latitude and Limited trims. The Sport trim comes standard with just the basics: cloth seats, a carpeted cargo load floor, a 4-speaker AM/FM/CD/MP3 audio system, cruise control, a tilt (not telescopic) steering wheel, an outside-temperature display, 205/70R16 all-season tires, hill-start assist, a nifty rechargeable and removable cargo-area flashlight, illuminated cupholders, a 60/40 split-folding rear bench seat, 16-in steel wheels, fog lamps, deep-tinted sun-blocking rear glass, black-painted side roof rails, a rear-window wiper and manual windows, mirrors and door locks. Standard safety features include dual-front airbags, front-seat side airbags, overhead airbags, electronic-roll mitigation, stability and traction control and 4-wheel anti-lock brakes. Popular Sport options include heated front seats, Bluetooth with voice command, 17-in alloy wheels and front-seat side airbags. Most Latitude features are available as options on Sport models. Moving up to the Latitude trim adds air conditioning, 17-in alloy wheels, 215/60R17 all-season tires, a driver's-seat height adjuster, a fold-flat front passenger seat, heated front cloth seats, a 60/40 split-folding and reclining rear seat, remote start, a leather-wrapped steering wheel with remote audio controls, a 115-volt accessory outlet, remote keyless entry and power windows, mirrors and door locks. Popular Latitude options include a 6.5-in touchscreen infotainment system, SiriusXM radio, a cargo security cover, a HomeLink garage-door opener and a power moonroof. The Limited trim brings the 2.4-liter engine, a 6-speed automatic transmission, leather seat trim, automatic climate control, a power driver's seat with manual lumbar adjustment, a leather-wrapped hand-brake handle, a trip computer, a 6-disc CD/DVD changer, HD Radio, SiriusXM radio, map lights, bright roof rails with adjustable crossbars, bright bumper trim and 4-wheel disc brakes. Optional only on the Limited is navigation and a 9-speaker Boston Acoustics sound system with two flip-down lift-gate speakers. A 2,000-pound Trailer Tow package is only available on Latitude and Limited models. It includes a 2.4-liter engine, an engine-oil cooler and a rear wiring harness. A dealer-installed Wi-Fi hotspot system is also available. Seldom accepted by the traditional Jeep crowd, the Patriot doesn't enjoy the resale value of a Wrangler or Grand Cherokee. Therefore, previously owned examples can be used-car bargains, and since these are rarely taken off road, they're less likely to be banged up from trail damage. 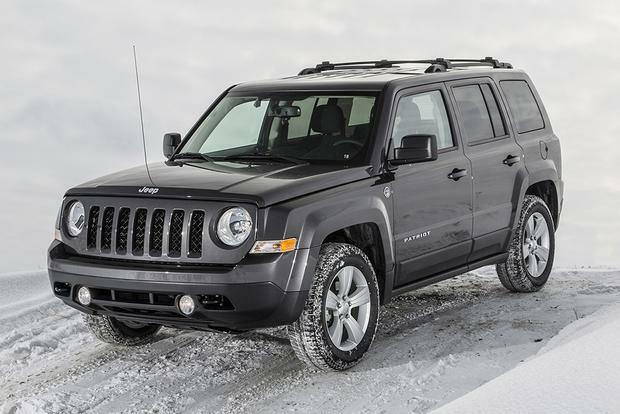 For a good idea of the prices of 2015 Jeep Patriots, check out the used-car values at KBB.com. You can also search the Autotrader Classifieds to see what models are for sale in your area. An incorrectly placed clamp for the power-steering return hose may allow the hose to detach, leak fluid and increase the risk of a fire. Recall repairs are required by law, even if the vehicle is out of warranty. Your dealer can check to see if the repairs were performed and, if not, will fix the car at no charge to you. NHTSA didn't give the 2015 Patriot a rating for side impacts or an overall rating but issued it just three stars for frontal collisions and rollover resistance. The Insurance Institute for Highway Safety gave the 2015 Patriot a Poor rating in the small-overlap front crash test and a Good rating for moderate-overlap front impacts, side impacts, head restraints, seats and roof strength. FCA covered the 2015 Patriot with a 3-year/36,000-mile basic warranty, a 5-year/unlimited-mile corrosion-perforation warranty and 5 years/100,000 miles of powertrain coverage with roadside assistance. 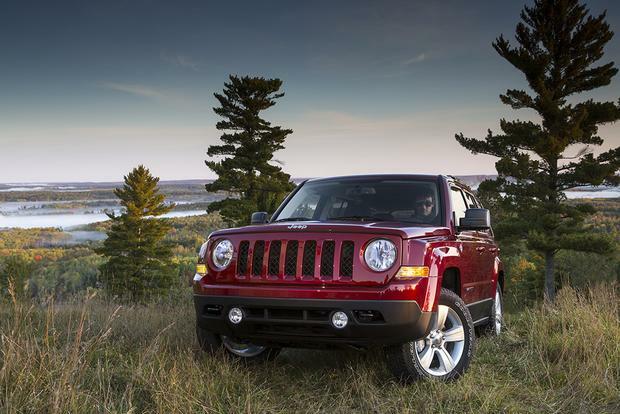 Jeep certified pre-owned cars cannot have more than 75,000 miles on the odometer and must be five years old or fewer. Those that pass a 125-point inspection receive a 3-month/3,000-mile bumper-to-bumper warranty, plus a 7-year/100,000-mile powertrain warranty from the car's original date of sale. Also included is a Carfax report, 24-hour roadside assistance, a car-rental allowance and a 3-month trial of SiriusXM radio. 2015 Ford Escape -- This top-selling urban runabout is available with a 168-hp 2.5-liter, a 173-hp 1.6-liter EcoBoost turbo or a 231-hp 2.0-liter EcoBoost turbo. Both FWD and AWD are offered, as well as an optional hands-free lift gate and automated-parking assist. 2015 Subaru Forester – The Forester was all-new for 2014 with added interior room, improved visibility and an advanced EyeSight safety system. All models come with standard AWD and have a good reputation for all-weather traction and durability. This crossover is available with a regular-fuel 170-hp 2.5-liter 4-cylinder or a peppy 250-hp premium-fuel 2.0-liter turbo in the sporty XT model. The Patriot has always been the red-haired stepchild of the Jeep lineup -- shunned by loyalists -- but it's a good all-around transportation buy with lots of interior room for its size and decent fuel economy. On all 2014-and-later models, except for the trail-rated Freedom Drive II version, is a conventional step-shift 6-speed automatic transmission, which does away with the somewhat-disconnected sound and feel of the continuously variable automatic transmission used in previous years. To ensure you have air conditioning, keyless entry and power windows, mirrors and door locks, look for a Latitude or a Sport with an upgrade package. Alternatively, because Patriots are such good used-car values, you can splurge and get a range-topping Limited with leather seats, auto air conditioning, SiriusXM radio and 4-wheel disc brakes. Always have a Carfax vehicle-history report done, and look for a Jeep that's seen obvious care, staying away from modified examples. Be sure to check with the dealer to confirm the Patriot you're looking at has had all the safety-recall items addressed.